This quote crossed my plate a while back and it really resonated with me. However, I like to take it a step further and say that it’s more like counting only the first downs your team makes. In football, first downs do not win games. Points do. Sometimes a single field goal is enough for a win, but most of the time you need touchdowns. A first down only gives you another set of downs to continue marching the ball down the field. Much like with B2B leads, which only give you a chance to continue your dialog with a prospective customer. Unlike businesses selling to consumers, where the business must rely on the consumer to initiate a dialog, business-to-business marketing is different. With B2B marketing, you can be proactive and reach out to potential customers with no prompting at all. You can generate your own leads. Before you do, however, you first need to define what a “lead” actually is. And one problem with the idea of B2B “leads” is that most businesses improperly define or misunderstand what a “lead” actually is. From there, you follow up with these “leads” via email and or phone and you attempt to move them from a marketing qualified lead (MQL) to a sales qualified lead (SQL). Problem is, sales people don’t want to bother with people that aren’t already qualified. They want buyers. And website visitors filling out a form on a web page, no matter what the offer is, does not qualify a lead. It does not make the person a buyer. Marketing Does Not Sell. People Do. In B2B sales, purchases are made within relationships. People buy from people, not from businesses. To accomplish this, trust has be established and cultivated. Machines, databases, and web pages are not designed to do this. They are not people. They are mechanisms. The root of the disconnect lies in the idea of MARKETING. Grammatically speaking, the word ‘marketing’ is a verb. It is the act of going to market. By definition, it is the process by which a business brings its products and services to market. Therefore, the idea or execution of marketing includes: branding (connecting with people), advertising (reaching people), and selling (transacting with people). It also includes transforming (changing peoples’ minds and attitudes) and inspiring (exciting and motivating people). Finally, marketing also involves serving. That is…helping to fulfill peoples’ needs. Notice the common denominator in all these things: PEOPLE. B2B marketing is about people. It’s about all these things. But ultimately it’s about people. So let’s remember that the problem with the idea of “leads” is that we misuse the term as a way to identify or flag contacts in our database systems as prospective buyers, when in fact those are merely data points in a system that represent a human individual. The relationship with the individual is what’s important. And in a relationship, you can’t control or dictate what the person needs or thinks they want. There is no data point for this. 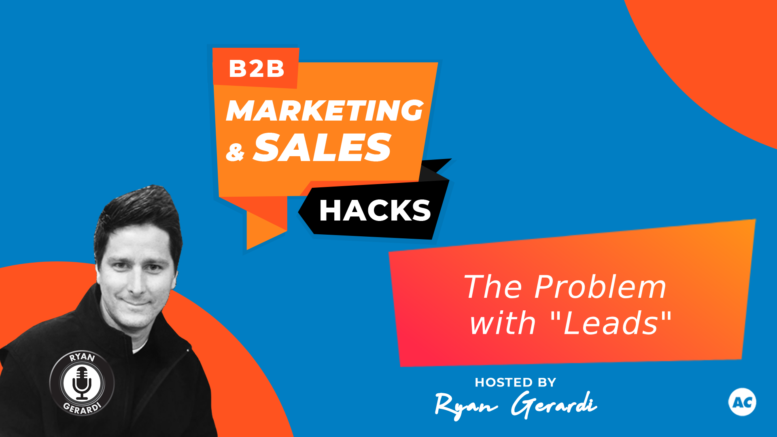 B2B Marketing and Sales Hacks is a series of recurring webcasts that concentrates on bridging the gap between marketing and sales. It is intended for business owners and marketing professionals interested in a community-driven and conversationally-based approach to solving some of the most challenging aspects of a B2B business, e.g. content creation, content marketing, contact management, technology, etc. It’s meant to help bridge the gap between marketing and sales.